We are a 3 dog family, yes these dogs are our family. One of our chihuahuas, Jerry, was born with a genetic issue that causes issues with his back hip. We were told buy the vet for a dog his size(3 1/2 lbs) that see would rather not do anything invasive at this time. I, myself have noticed it seems to bother him more in the winter months. Cherish Your Pet Concentrated hip & joint glucosamine for dogs supplement was shipped to us via Amazon, our family has prime so it arrived within 2 days. It was very well packaged and safety sealed on the outside and inside. It is stored in a white plastic screw top tub that is very easy to open. It is an 8 oz powder that is made of all natural ingredients. The directions for use are displayed on the package with a first 3 weeks and also a maintenance dosage. The tub also has a plastic measuring scoop for just the perfect dosage. The product is made in the USA and is cruelty free. The powder is a gray/brown color and to me has a banana smell to it. Because my dogs are so small I choose to mix the power with wet food. My doggies eat it right up and are off to play. I am sure with continued use Jerry should have a more enjoyable winter with less joint issues. If you just enjoy seeing your dog bounding around like a pup, then our best glucosamine for dogs supplement is the perfect solution for you. Whether for prevention, recovery from surgery, or just to reduce and delay the effects of old age. We are committed to minimising, and eliminating where possible, distress for you and your dog, irrespective of whether your dog is small, medium or large, young or old. 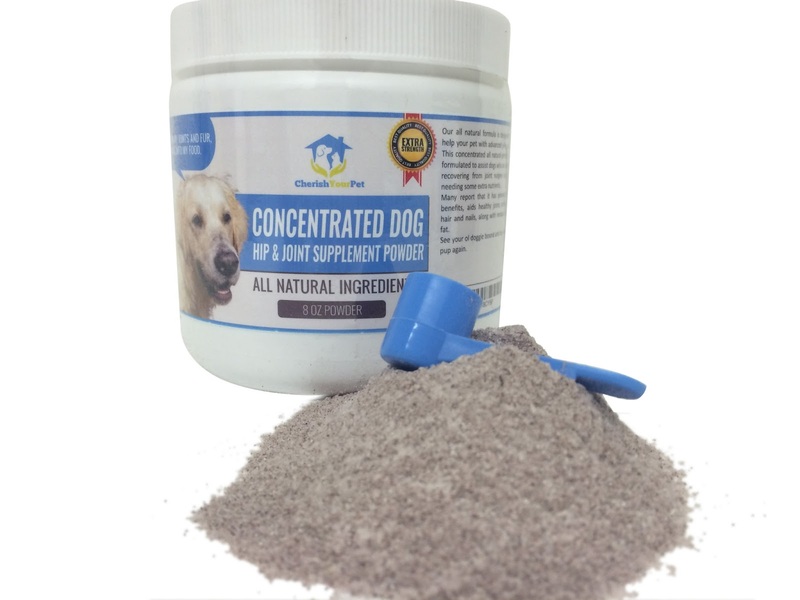 Our all natural Best Joint Supplements for Dogs Powder, manufactured here in the USA, is designed to help you demonstrate your love and care for your dog and avoid putting them on strong meds, and is particularly helpful for older or senior dogs. Easily mixed into your dog's normal food, our odorless powder will avoid the problems of force feeding your dog to chew a hard or large tablet, especially if they don't like the taste and texture. For your ease of use, the container comes with its own plastic measuring scoop, and is small enough for you to take around with you if your dog needs feeding outside of the home. Manufactured in a FDA approved facility, it contains a natural blend of vitamins, extracts and minerals to support joint health, including MSM and Vitamin E. Glucosamine Chondroitin for dogs provides powerful relief from joint pain and stiffness while helping maintain and improve your Dog's mobility and range of motion! - Provides targeted support for joint pain and stiffness associated with age or recovery. 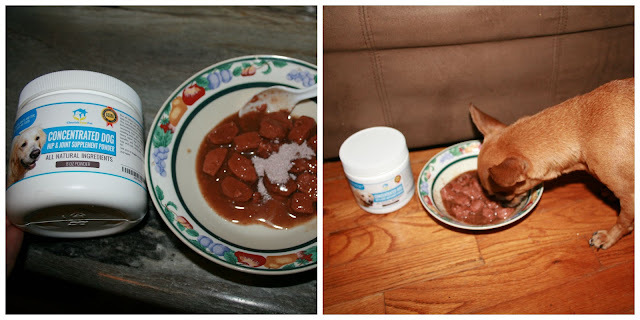 - Neutral flavor, easily add to your dog's food for easy dosing.